People fail to get along because they fear each other, they fear each other because they don’t know each other; they don’t know each other because they have not communicated with each other. —Martin Luther King, Jr.
View The most important part of your job on Notist. As designers, we pride ourselves on being great communicators. We go to extreme lengths to communicate with users in a language they understand, enabling them to engage with our messages and feel like they’re part of a story we built just for them. We take great satisfaction from putting ourselves in the shoes of the user, and yet we fail to do the same with those we talk to everyday. Communicating with people around us is the most important aspect of our profession. Being able to sell our work, justify our decisions and convey the feeling of trust and respect any designer should enjoy, is key for every one of us. 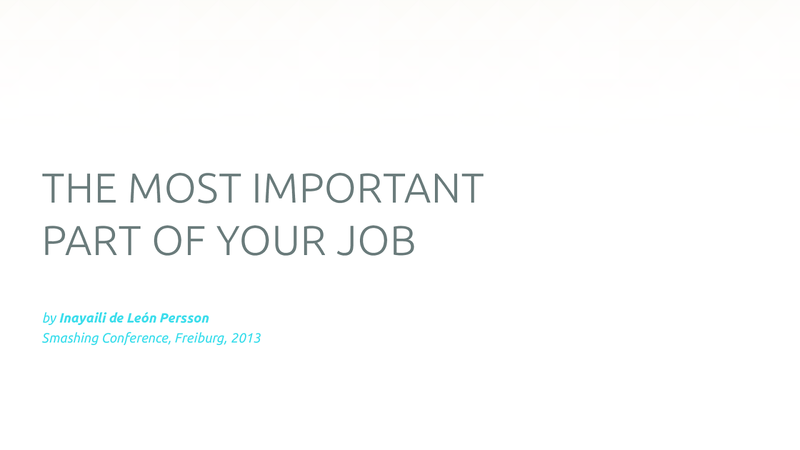 In this talk, I will share some stories of how communication can affect our jobs. Some are happy stories, some are not, but all of them have one question in common: how can we apply our creative skills to effectively communicate with people?